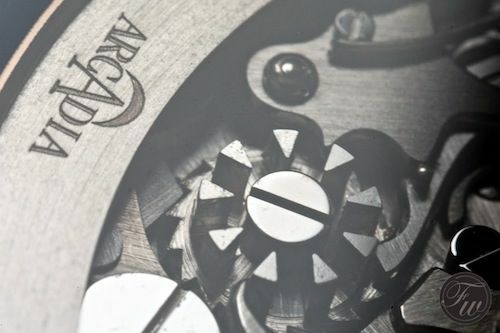 Our friends from Arcadia lent us one of their beautiful Vintage 22 timepieces to give it a test drive. 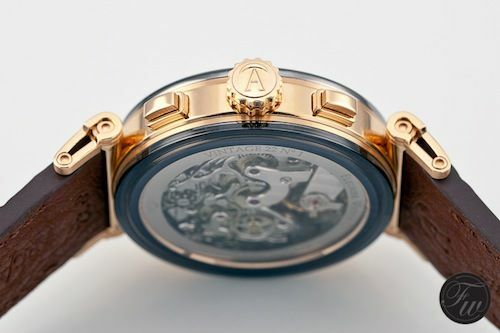 A rose gold classic designed watch with a vintage Valjoux caliber 22 movement. That’s something we couldn’t refuse of course! 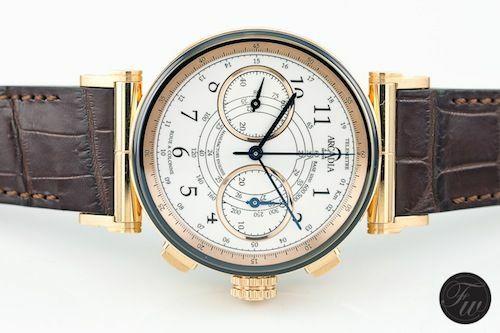 This beautiful 43mm rose gold column wheel chronograph has a lot of ingredients from vintage chronograph watches, but has been restyled and totally made up to date. 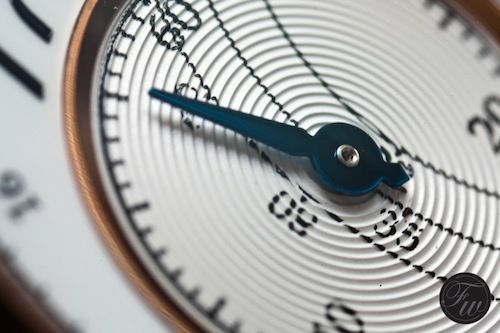 Although we love vintage ‘dress’ chronographs, most of them are around 37mm are therefore quite small for these days. 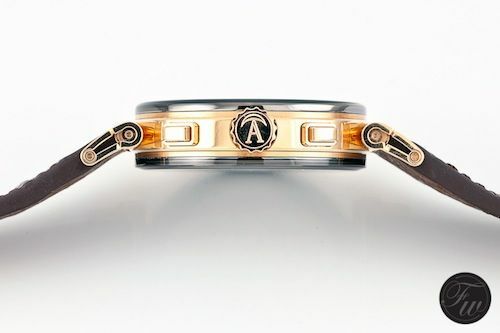 To be honest, it would look silly on our wrists (but that’s perhaps a shortcoming of the big fat Fratello team). 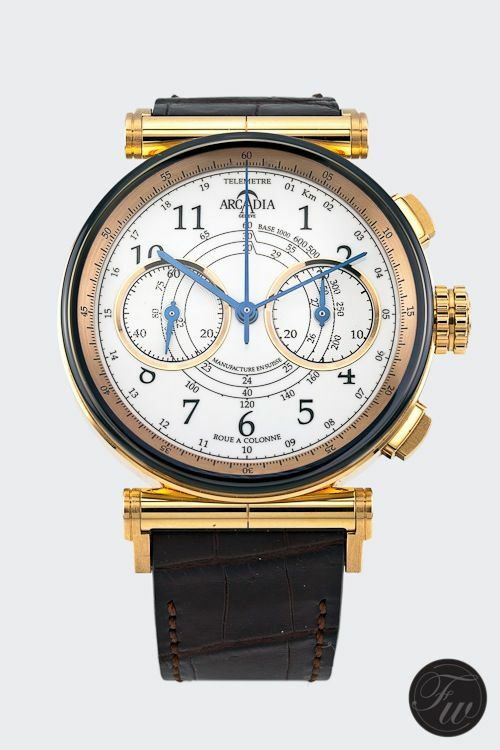 This Arcadia Vintage 22 looks decent on our wrists and not too big at all. 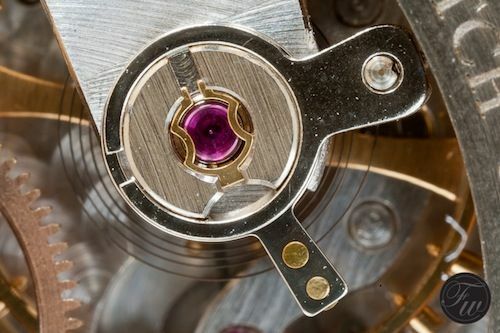 Probably because the watch has not only a sapphire crystal on the front, but also on the backside of the watch. This creates a nice ’rounded’ look to the case due to the dark glow edge of the sapphire crystal as you can see on the pictures. 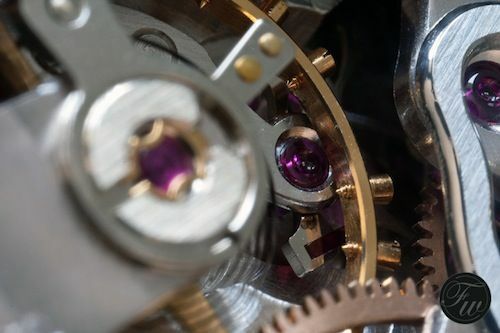 The construction of the lugs is very interesting as it leaves the round case design intact just like we’ve seen on the older round cased IWC DaVinci models. As you can see, the thick Porosus Crocodile strap fits perfectly between the long lugs and snug comfortable around your wrist. 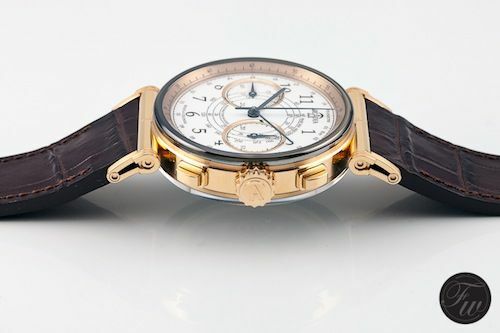 The column wheel chronograph is a movement that is being operated by two rectangular shaped gold pushers. The winding and setting crown is beautifully shaped as well and very easy to grasp. 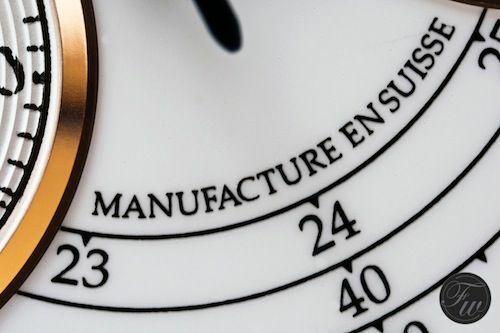 Something we find important in a hand wound watch. 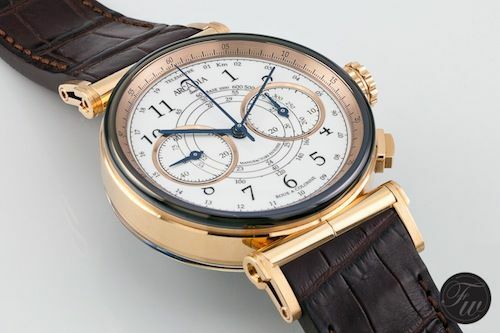 Below the sapphire crystal is a gold chronograph seconds scale. 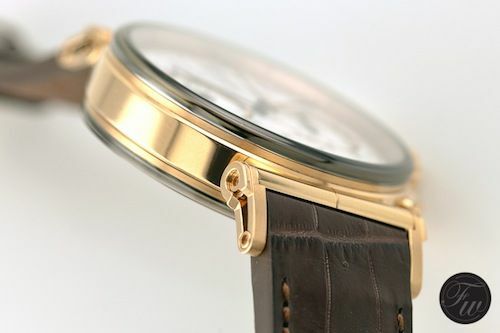 The same gold accent is also used around the sub dials of the watch. 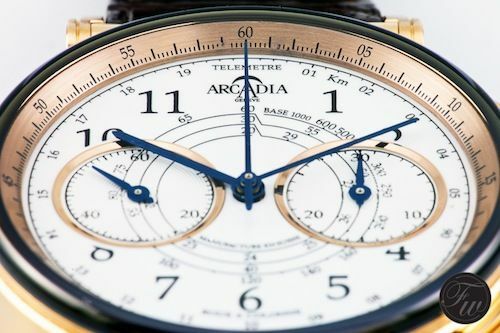 It gives the cream colored dial this extra edge, together with the blued hands. 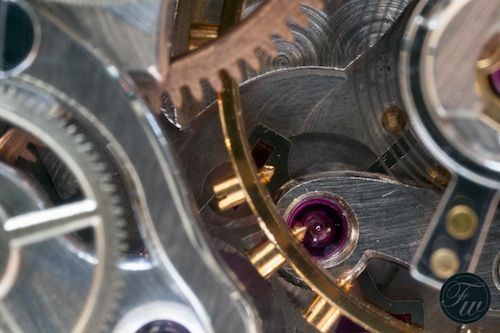 The dial might look a bit busy, but it resembles a lot of chrono dials from the past. It has a few different scales inside, such as a telemeter and tachy ring. 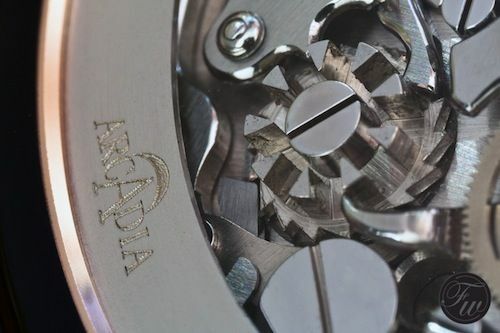 Arcadia assembled the movement by hand, polished and bevelled it with a Cote de Geneva finish (we explained some things about finishing here: Movement decoration explained). 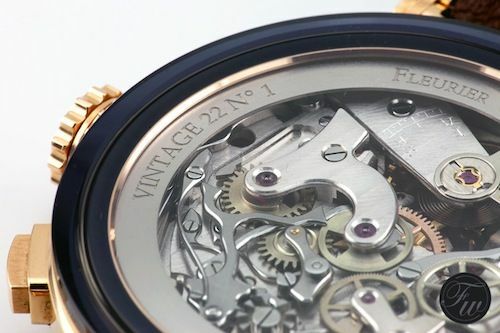 This vintage valjoux 22 hand wound movement has a power reserve up to 44 hours. This means it needs a full winding in less than two days, but this shouldn’t be a problem with its large but nicely crafted winding crown. 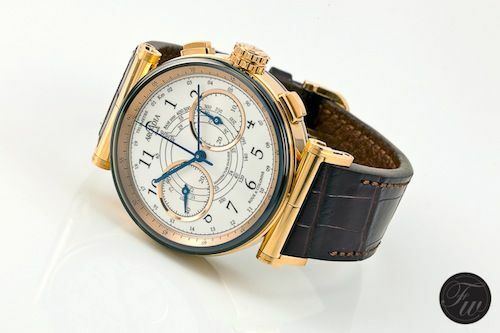 The price of this beauty is just below 40K CHF and only 35 pieces are being made of this Vintage 22 timepiece. Enjoy the photos of this stunning rose gold timepiece! 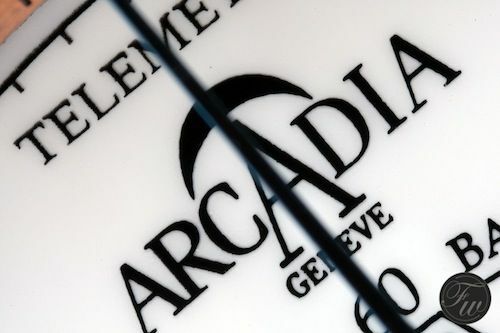 More information can be found on the official Arcadia website and their Facebook page.